This chapter will provide an overview of a number of related research areas that connect with learning design. In particular it will provide a description of a number of related research fields: pedagogical patterns, Open Educational Resources (OER), instructional design and learning sciences. It will attempt to show how these areas are related to but also distinct from learning design. Many are arguing that there is a need for a fundamental change in the way in which we design and support learning interventions. That traditional outcomes-based, assessment driven and standardised educational systems and processes do not meet the needs of today’s learners (Beetham & Sharpe, 2007; Borgeman, et al., 2008; Sharpe & Beetham, 2010). A number of triggers are evident. Firstly, there is the broader societal context within which educational sits. Giddens (Giddens, 1999), Castells (Castells, 2000) and others describe the networked and globalised nature of modern society, and the impact of the changing nature of society values (including the defragmentation of the family unit, polarised perspectives on secular vs. religion-based beliefs, changing roles for individuals and organisations). Reigeluth (Reigeluth & Carr-chellman, 2009, p. 390) argues that we have seen a shift from the industrial to information age, where knowledge work has replaced manual labour as the predominant form of work. Within this context he argues that we need to place a greater emphasis on lifelong and self-directed learning. The greater complexity of modern society (both in terms of societal systems and technological tools) requires specific types of competences to make sense of and interact within this context, such as higher order thinking skills, problem solving, systems thinking and the ability to communicate, collaborate and interact effectively with others. Within this broader societal context there are a number of specific triggers influencing and shaping the context of modern education. Firstly, in terms of approaches to learning there has been a general shift away from individual, behaviourist approaches to those that are more authentic, contextual and social in nature. Constructivist and dialogic approaches have become more prevalent, with a rich set of empirically based case studies of applications of strategies such as problem-based learning, case-based scenarios and inquiry-based learning. Secondly, over the past thirty years or so technologies have had a steady, increasing impact on how learning is designed and supported, from the early days of programme instruction and computer-assisted learning packages through to the use of the Web and more recently Web 2.0 tools and services, online gaming environments, mobile devices and 3D environments such as SecondLife. As a consequence a body of research around the competences and skills needed to effective use and interact these new technologies has emerged. Terms such as digital literacies, information literacies, 21st Century literacies have been used, each with subtle nuances and different foci. However fundamentally the central issue is about the literacies needed to communicate with others and make sense of information (and more specifically how to do this in a digital context). Of particular note within this broader discourse, Jenkins et al. (Jenkins, 2009, p. 4) have identified twelve skills which they argue are necessary to interact in what they term this new participatory culture, namely – play, performance, simulation, appropriation, multitasking, distributed cognition, collective intelligence, judgment, transmedia navigation, networking and negotiation. The executive summary to the report states that ‘fostering such social skills and cultural competences requires a more systemic approach to media education’ (pg 4). This is at the heart of the learning design methodology approach outlined here. The aim is to present a more systematic approach to the educational design taking account of all the stakeholders involved in the process. To sum up, because the context of modern education is rapidly changing, traditional approaches to the design and delivery of learning interventions are being challenged and may no longer be appropriate to meet the needs and expectations of modern learners. New pedagogies and innovative use of technologies seem to offer much promise in terms of providing new, exciting educational experiences for learners. However in reality there is little evidence of this happening. Educational innovations in both pedagogical approaches and innovative use of technologies remain the remit of educational innovators or early adopters, there is little evidence of mainstream adoption and indeed depressingly taken as a whole the majority of educational offerings are still based on fairly traditional approaches, with a primary focus on content and assessment of outcomes, delivered via traditional didactic approaches. See for example a recent review of the use of Web 2.0 tools in Higher Education (Grainne Conole & Alevizou, 2010). The central argument of this book is that adopting a more principled, design-based approach to teaching and learning processes might offer a solution to enabling practitioners to make more informed choices about their creation of learning interventions and better use of good pedagogy and new technologies. Before outlining our learning design methodology, it is important first to consider the broader definition of what is meant by design practice and examples of how it is used in other disciplines. Design theory refers to identifying methods (or models, techniques, strategies and heuristics) and when to use them. Reiguluth (Reigeluth & Carr-chellman, 2009, p. 7) argues that design theory is different from descriptive theory, in that it is goal oriented and normative. It identifies good methods for accomplishing goals, whereas descriptive theory describes cause-effect relationships. Arguably teachers need to develop both – design expertise through application of a design-based approach to the creation of learning interventions and descriptive expertise in terms of interpreting and understanding the learning that takes place. The learning design methodology described in this paper aims to facilitate the development of both approaches. In this book I want to argue that we need a more formal design language for education, to make more explicit and sharable design intentions and to enable designers and users of designs to understand their context of use, their origins, and their intentions. This section provides a definition for the term design language and provides examples of how it is used in other professional domains. Design is a key feature of many professions and in terms of specifically exploring the design aspects in an educational context. I would like to first consider design practices in related fields. I focus here in particular on three disciplines: Music, Architecture and Chemistry and describe how design approaches have been developed in each of these. I then summarise some of the key characteristics of design practice that emerge and explore the implications of these in terms of the application of design principles to an educational context. It is worth beginning by comparing general language use with design language. Language is what people use for communicating information and ideas, design language is what designers use to communicate design plans, and intentions to each other. Cole, Engestrom and Vasques (Cole, Engeström, & Vasquez, 1997) argue that ‘the Languages used to a great extent shapes what can and cannot be thought and said’ (cited in (Gibbons & Brewer, 2005, p. 113)). Design Languages can be used to both generate designs and as a mechanism for interpreting and discussing them. They are used in a range of professions, where there is a focus on developing a specific artefact of some kind. Examples include architecture, music composition, writing, choreography, mathematics and computer programming. With reference to the design of software systems, Winograd (Winograd, 1996) argues that design is not a static noun but about the activity of design. He identifies a number of important aspects: design as a conscious process, design as dialogue with materials, design as a creative process, design as a communicative process and design as social activity. He describes design languages as ‘visual and functional languages of communication with the people who use an artefact. A design language is like a natural language, both in its communicative function and in its structure as an evolving system of elements and relationships among those elements’ (Winograd, 1996, p. 64). I now want to turn to some examples of how design languages are used in other professions. I will consider three examples – the development of musical notation, architectural designs and design in chemistry. Musical notation captures abstract musical designs in the form of graphical, textual and symbolic representations. It is precise enough that a piece of music written by a composer from 300 or 400 hundred years ago can be accurately replayed. Early musical notations can be traced back to 2000 BC, but the standard notation used today is a relatively recent phenomenon, before its development, music had to be sung from memory. This severely limited the extent and reach of music, as well as resulting in a loss of fidelity of the original music as they changed from person to person memorising them. 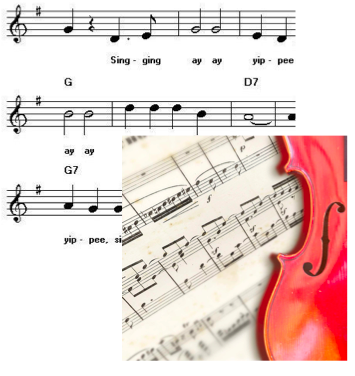 Musical notation went through a range of forms before settling on the notations we use today (Figure 1). The notation includes a complex set of instructions about not just the notes to be played and their sequence, but the timing, intonation and even some of the emotion embodied in the music. Architectural notation helps articulate and share an Architect’s origin vision behind the development of a building and make that explicit and sharable with others involved in the design and development of the building. Buildings are complex and 3-dimensional. Design decisions have to cover a range of factors, such as the layout of the building, the relationship between the different components, the types of materials, the nature of the surrounding situation of the site. Different designs are therefore needed to relate certain elements of the design to each other while ignoring others, and these allow the designer to see their creation from different perspectives. 3-D visual representations are often annotated with text and supplemented by tables of data. In recent years design representations in Architecture have being computerised with the emergence of sophisticated Computer Assisted Design tools. Arguably use of these CAD tools has influenced the practice of design, in addition to facilitating more effective sharing of designs. Chemists use a number of design representations, from chemical symbols for individual atoms, through various visual representations for displaying molecules and chemical equations for the design of chemical synthesis and for explanation of particular chemical properties. As with music and architecture the design representations that have been developed closely mapped to the discipline itself and the key focus of interest. So Chemistry is fundamentally concerned with the properties and chemical behaviours of individual atoms and how these can combine in different ways to create molecules with different properties. 2-D representations are common (for example chemical equations) but 3-D representations are also useful and particularly valuable when looking at large molecules with complex typologies. 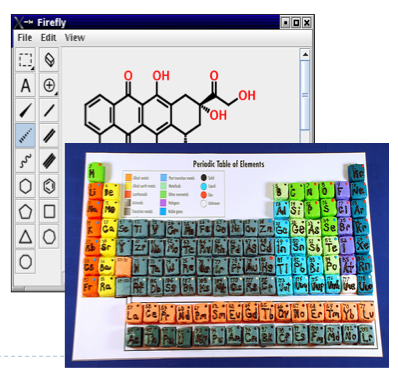 As in architecture a number of computer-based tools have now been developed to enable drawing and manipulation of molecules. These can in some instances be based on real data, such as individual atomic coordinates of individual atoms and so are also powerful modelling tools. Gibbons and Brewer (Gibbons & Brewer, 2005, p. 121) argue that once a notational system is established it can become i) a tool for remembering designs, ii) a structured problem-solving work space in which designs can take form and be shared, iii) a kind of laboratory tool for sharpening and multiplying abstract design language categories. Indeed in the examples cited above it is evident that there is a complex evolution of design languages and associated notations, and that this evolution is closely tied to the nature of the subject domain and what is of particular importance. So for music it is ensuring the accurate representations of the sounds in time, for architecture it is seeing the ways in which the different components connect and how they look overall and in chemistry it is about foregrounding the associated chemical properties and patterns of behaviour of the atoms and molecules. Gibbons and Brewer (Gibbons & Brewer, 2005, p. 115) list a set of dimensions of design languages. The first is complexity, namely that design are merely partial representation of much more complex, and multifaceted ideas in our minds. The second is precision, there is a tension between the natural, fuzzy nature of real practice and tightly defined specification. This tension is very evident in an educational context as described later, in particular in the specification of formal technical learning designs that can be translated into machine-readable code and fuzzy, practice-based designs. The third is formality and standardisation, which refers to the importance of ensuring that terms used mean the same to all users. The fourth is the tension between personally created designs and those that are shared with others. Designs only become public or sharable through negotiation and interaction with others. Designs should never be seen as static artefacts and are always dynamic and co-constructed in context. The fifth is the tension between implicit, individual designs to those that are completely explicit with clearly defined terms and rules. Again this is a crucial issue in an educational context, where traditional teaching practice has been implicit and designs fuzzy. Shifting to more explicit and sharable designs requires a change of mindset and practice. Related to this are issues around standardisation vs. non-standardisation. In terms of these points, there is a tension with designs in terms of how much they focus on precise presentation, specification and how much on the more aesthetic, visionary aspects of the design. Derntl et al. (Derntl, Parish, & Botturi, 2008) consider this in an instructional design context, arguing that ‘On the one hand, solutions should be creative, effective and flexible; on the other hand, developers and instructors need precise guidance and details on what to do during development and implementation. Communication of and about designs is supported by design languages, some of which are conceptual and textual, and others more formal and visual.’ They present a case study where both a creative solution (“beauty”) and clear-cut details (“precision”) are sought. Finally there are issues around computability. Some languages are so formalised and precise that they can be converted into machine runnable code. Gibbons and Brewer (Gibbons & Brewer, 2005, p. 118) go on to argue that designs can be shared in two ways i) by a description that relies on natural language or ii) through a specialised notation system that uses figures, drawings, models or other standard symbolic representations to express the elements and relationship of the design. Designs have a number of components. Firstly the context in which the design is created and used; i.e. a design carries with it a socio-cultural element – the background and context, both of the individual and the educational setting. Secondly the inherent beliefs of the designer; i.e. a design carries with it intentions, aspirations and beliefs. In a learning content this is the designer’s believes about what should be learnt and how it should be achieved. Donald and Blake (Donald, Blake, Girault, Datt, & Ramsay, 2009) see this inherent belief basis of teaching practice as a vital tool for unlocking and shifting practice. They have developed a learning design system, HEART (HEaring And Realising Teaching-voice), which aims to support teachers learning design practice by eliciting and depicting the pedagogical beliefs underpinning a learning design or a resource. In an educational context our implicit designs are based on a mix of theoretical concepts, prior examples, personal ideals and idiosyncratic opinions. Finally, designs should encourage reflection and should support iterative redesign and reuse. Having described design practice in a number of fields, this section looks explicitly at the ways in which learning and teaching innovations have been promoted and supported. It considers the strategies that have been used to scaffold teaching practice to ensure effective use of good pedagogy and to promote innovative use of new technologies. Whilst not intending to be exhaustive this section aims to give a flavour and overview of some of the approaches, before introducing learning design as an alternative approach. It is important to note that learning design as a methodology does not seek to replace these existing approaches, but instead intends to draw on them using a theoretical framework which focuses on the mediating artefacts used in learning and teaching. Learning design is intended to be a holistic approach, covering all stakeholders involved in the learning and teaching process. Instructional Design has a long history as an approach to systematically designing learning interventions. It has been defined as ‘The process by which instruction is improved through the analysis of learning needs and systematic development of learning materials. Instructional designers often use technology and multimedia as tools to enhance instruction’ (Design, n.d.). Reiser (Reiser, 2001aa) defines Instructional Design as encompassing ‘the analysis of learning and performance problems, and the design, development, implementation, evaluation and management of instructional and non-instructional processes and resources intended to improve learning and performance in a variety of settings’. He identifies two practices that form the core of the field, i) the use of media for instructional purposes, ii) the use of systematic instructional design processes (Reiser, 2001b). Instructional designers design instruction to meet learning needs for a particular audience and setting. Learning design, in contrast, as described later, takes a much broader perspective and sees design as a dynamic process, which is ongoing and inclusive, taking account of all stakeholders involved the teaching-learning process. Instructional Design tends to focus more on the designer as producers and learners as consumer. A number of key features characterise or help define Instructional Design as an approach. Van Merrienboard and Boot (Van Merrienboer & Boot, 2005, p. 46) describe Instructional Design as an analytical pedagogical approach. This includes the development and evaluation of learning objectives. A key milestone was Bloom’s Taxonomy of Educational Objectives (Anderson & Krathwohl, 2001; Bloom, 1956). In 1965 Gagné (Gagné, 1965) published his conditions of learning, describing five domains of learning outcomes (verbal information, intellectual skills, psychomotor skills, attitudes and cognitive strategies). He argued that each required a different set of conditions to promote learning. He also described nine events of instruction or teaching activities needed to support the attainment of the different learning outcomes. At the heart of the early instructional design work were three aspects: task analysis, objective specification and criterion-referenced testing. Since this early work, Instructional Design has developed in to a significant field and numerous instructional design models have been produced and evaluated. It is now a recognised professional discipline, with established masters-level courses providing a foundation on the fundamentals of the field. Instructional Design as an approach seeks to identify learning goals and through analysis of these goals deriving instructional methods to achieve them. This involves the development of a set of rules for employing instructional strategies to teach different content in different settings, with the rule set linking to conditions, instructional methods and learning outcomes. Instructional Design is also in essence a systems approach to instruction and instructional development, i.e. thinking systemically about instruction and seeing teachers, learners, content, etc. as components of a larger system. integrate their new knowledge into their everyday world (Integration Principle). The principles were an attempt to identify the fundamental principles of good instructional design. The central focus is on the tasks that the learners do, through activation, demonstration, application and integration. The principles have been extensively quoted and many of the models that have been subsequently developed explicitly map to them. In recent years work in Instructional Design has shifted to attempt to take a more explicit account of constructivist and socially situated approaches to learning. Learning Sciences is an interdisciplinary field that emerged in the mid-nineties (Sawyer, 2006). It developed in part as a backlash against traditional notions of education, focusing on instructionism (Papert, 1993 cited in Sawyer, 2006) as the principle paradigm, namely that learning is about acquiring knowledge which consists of a collection of facts and procedures. Sutcliffe (Sutcliffe, 2003, p. 242) defines instructionism as ‘learning by telling and emphasizes delivery of content; in contrast, constructionist approaches emphasize learning by doing’. New research on learning suggested that this narrow perspective of learning was incorrect and that there was a need to take account of a number of additional factors: the importance of deep conceptual understanding, a focus on learning rather than just teaching, the creation of appropriate learning environments to foster learning, the need to build on prior learning and the importance of reflection (Bransford, Brown, & Cocking, 2000). Sawyer lists five key influences that underpin learning sciences: constructivism, cognitive science, educational technology, socio-cultural studies and studies of disciplinary knowledge. Learning sciences as a field is concerned with developing a scientific understanding of learning. This includes the design and implementation of learning innovations, and an aspiration to improve instructional methodologies. The real value in much of the learning sciences work is the rich, rigorous empirical studies which have been carried out, which collectively give us a much deeper understanding of authentic, learning in real contexts. Interest in learning objects emerged in the early nineties, with the promise of creating digital resources that could be shared and reused. The term is contested and has been used to describe everything from raw digital assets up to whole integrated curricula. Wiley provides a succinct definition: Learning objects are educationally useful, completely self-contained chunks of content (Wiley, 2005, p. 2). They usually consist of three parts: educational objectives, instructional materials and an assessment component. (Littlejohn, Falconer, & McGill, 2008) identify four levels of granularity: i) digital assets – a single file, raw media asset, ii) information objects – structured aggregation of digital assets, iii) learning activities – tasks involving interactions with information to attend a specific learning outcome, iv) learning design – structure sequences of information and activities. A considerable body of research has been done into the development of tools for the creation and storing of Learning Objects. However despite the vision in terms of their potential to development an educational exchange economy, the degree of actual reuse is relatively low. More recently a related field has emerged, namely the Open Educational Resource (OER) movement. Supported by organisations such at the Hewlett foundation and UNESO, the vision behind OER is to create free educational resources that can be shared and reused. (Wiley & Gurrell, 2009, p. 362) argues that OER are ‘learning objects whose intellectual property status is clearly and intentionally labelled and licensed such that designers are free to adapt, modify and redistributed them without the need to seek permission or pay royalties’. He goes on to state that OER have unlocked a new set of issues for design, namely those around how to repurpose resources for different local context, taking account of linguistic and cultural issues. A number of centres for promoting and researching the use of Learning Objects and OER have arisen, as well as a host of online repositories. The Globe repository for example acts a gateway to other learning object repositories.(http://globe-info.org/) . The Reuseable Learning Objects centre (http://www.rlo-cetl.ac.uk/) aims to design, share and evaluate learning objects and has produced a tool, GLO Maker for creating Learning Objects (http://www.glomaker.org/). With the rise of the Open Educational Resources movement in recent years not surprisingly a number of support centres and community sites have emerged. OpenLearn, alongside its repository of OER, created Labspace and provided a range of tools for fostering community engagement, such as a free tool for video conferencing (Flashmeeting) and a tool for visualisation (Compendium) (http://openlearn.open.ac.uk). The aim was to provide an environment for sharing of good practice and promoting the reuse of OER. LeMill is a web-based community for finding, authoring and sharing open educational practices (http://lemill.net/). Similarly, Connexions provides a space for educators and learner to use and reuse OER (http://www.oercommons.org/community/rice-university-connexions). Carnegie Mellon, through its Open Learning Initiative (http://www.oercommons.org/community/rice-university-connexions), adopts a more evidence-based approach. Finally, Carnegie Mellon and the Open University in the UK are developing a global network of support for researchers and users of OER, through Olnet (http://olnet.org/ ). Conole and McAndrew provide a brief history of the OER movement (G. Conole & McAndrew, 2010). However despite the wealth of OER repositories that are now available, evaluation of their use indicates that they are not being used extensively in teaching and there is even less evidence of them being reused (Petrides & Jimes, 2006). As such some research has begun to explore the practices around the creation, use and management of OER, with the view that if we can better identify and understand these practices we will be able to developed approaches to improve the uptake and reuse of the OER. This is the central focus of the OPAL project (http://oer-quality.org/), work to date has included a review of 60 case studies of OER initiatives and from these abstracted eight dimensions of Open Educational Practice (http://cloudworks.ac.uk/cloudscape/view/2087). Finally, it is worth mentioning that over the past ten years or so a range of professional networks and support centres have emerged which have as part of their remit a role in promoting good practice. Some have a specific focus on technologies (for example the Association for Learning Technology), others are either focused on educational practices or subject disciplines (for example the Higher Education Academy subject centres). In addition it is relatively common now for institutions to have some form of specialist unit concerned with promoting good approaches to teaching and learning practice and to helping practitioners think about how they can use technologies more effectively. In addition to these support centres there is also an international network of researchers and developers interested in exploring the use of technologies in education. Many of these have associated journals, conferences, workshops and seminar series, as well as a range of mechanisms for connecting members virtual via mailing lists, forums and social networking tools. These networks and support centres provide a range of mechanisms for supporting practice – facilitation of workshops and conferences, online events and discussions spaces, repositories of resources and case studies of good practice. Anderson, L. W., & Krathwohl, D. R. (2001). A taxomony for learning, teaching and assessment: a revision of Bloom’s taxonomy of educational objectives. New York: Longman. Bloom, B. S. (1956). Taxonomy of educational objectives, the classification of educational goals: handbook 1 - cognitive domain. New York: McKay. Borgeman, C., Abelson, H., Dirks, L., Johnson, R., Koedinger, K., Linn, M., et al. (2008). Fostering learning in the networked world: the cyberlearning opportunity and challenge, Report of the NSF task force on cyberlearning. Bransford, J. D., Brown, A., & Cocking, R. R. (2000). How people learn: brain, mind, experience and school - expanded edition. Washington D.C.: National Academy Press. Castells, M. (2000). The rise of the networked society, The information age: economy, society and culture, Vol, 1, Second Edition. Cambridge, MA; Oxford, UK: Blackwell. Cole, M., Engeström, Y., & Vasquez, O. A. (1997). Mind, culture and activity: seminal papers from the laboratory of comparative human cognition. Cambridge, UK: Cambridge University Press. Conole, G., & McAndrew, P. (2010). A new approach to supporting the design and use of OER: Harnessing the power of web 2.0 In M. Edner and M. Schiefner (Eds) Looking toward the future of technology enhanced education: ubiquitous learning and the digital nature. Derntl, M., Parish, P., & Botturi, L. (2008). Beauty and precision in instructional design. Paper presented at the Edmedia, Lugano, Italy. Donald, C., Blake, A., Girault, I., Datt, A., & Ramsay, E. (2009). Approaches to learning design: past the head and the hands to the HEART - of the matter. Distance Education, 30(2), 179 %U http://www.informaworld.com/110.1080/01587910903023181. Gagné, R. M. (1965). The conditions of learning. New York: Holt, Rinehart and Winston. Gibbons, A. S., & Brewer, E. K. (2005). Elementary principles of design languages and design notation systems for instructional design. In J. M. Spector, C. Ohrazda, A. V. Schaack & D. A. Wiley (Eds. ), Innovations in instructional technology. Mahway, NJ: Lawrence Erlbaum Associates. Giddens, A. (1999). Runaway World: How Globalisation is Reshaping our lives. London: Profile. Jenkins, H. (2009). Confronting the challenges of participatory culture: Media education for the 21st century: Mit Pr. Littlejohn, A., Falconer, I., & McGill, L. (2008). Characterising effective eLearning resources. Computers & Education, 50(3), 757-771 %U http://www.academy.gcal.ac.uk/people/falconer.html. Merrill, M. D. (2009). First principles of instrction. In C. M. Reigeluth & A. Carr-Chellman (Eds. ), Instructional design theories and models III. NY: Lawrence Erlbaum Associates. Papert, S. (1993). Mindstorms. New York: Basic Books. Petrides, L., & Jimes, C. (2006). Open Educational Resources: towards a new educational paradigm iJournal, 14. Reigeluth, C. M., & Carr-chellman, A. A. (2009). Instructional-Design Theories and Models, Volume III: Routledge %@ 0805864563 %7 1. Reiser, R. A. (2001a). The history of instructional design and technology: part 1 a history of instructional media. ETR&D, 49(1), 53-64. Reiser, R. A. (2001b). The history of instructional design and technology: part 2 a history of instructional design. ETR&D, 49(1), 53-64. Sawyer, R. K. (2006). The Cambridge handbook of the learning sciences: Cambridge University Press %@ 0521845548, 9780521845540. Sharpe, R., & Beetham, H. (2010). Rethinking learning for the digital age: how learnes shape their own experiences. London: Routledge. Sutcliffe, A. (2003). Multimedia and virtual reality - designing multisensory user interfaces. Mahwah, NJ: Lawrence Erlbaum Associates. Van Merrienboer, J. J. G., & Boot, E. (2005). A holistic pedagogical view of learning objectsL future directions for reuse. In J. M. Spector, C. Ohrazada, A. V. Shaack & D. A. Wiley (Eds. ), Innovations in instructional technology. Mahah, NJ: Lawrenc Erlbaum Associated. Wiley, D. (2005). Learning objects in public and Higher Education. In J. M. Spector, C. Ohrazda, A. V. Schaack & D. A. Wiley (Eds. ), Innovations in instructional technology. Mahwah, NJ: Lawrenc Erlbaum Associates. Wiley, D., & Gurrell, S. (2009). A decade of development…. Open Learning: The Journal of Open and Distance Learning, 24(1), 11 %U http://www.informaworld.com/10.1080/02680510802627746. Winograd, T. (1996). Brigning design to software. New York: AddisonWliey. This entry was posted on Tuesday, December 7th, 2010 at 4:31 pm	and is filed under General. You can follow any responses to this entry through the RSS 2.0 feed. You can leave a response, or trackback from your own site. It seems that only 11 skills are listed. (p.1, Jenkin’s refference) Can’t compare it. Learning Sciences seems to me a little bit confusing and poor in the sense of quite a long history of learning theories from which good ways of instruction must be derived. The standard theories from behaviourism, via cognitivism, and constructivism could be mentioned. Even if there can be a fuzzy line between both fields (Reigheluth, Carr-Chellman, 2009). At the very beginning of chapter 2 you are talking about pedagogical patterns, but in the text this field is replaced by Professional networks an support centres. The bifurcation of theories of learning into categories like instructionist and cognitive constructivist does not work for me. Some like dualisms; I don’t. I think in terms of both/and. I prefer a the historical narrative, which tells a story of continuity and change over time….and I plan instruction taking into consideration the content, the procedures (1, 2, 3), and the conditions that will promote learning for a range of learners .. If…, then…. Hi Mary nice points I kind of agree with you about the categories of learning, in reality most learning is a mix, nonetheless i think they are maybe helpful in drawing out the distinctive nature of different types of learning and some notion of the historical development of the understanding/field.